A little over a year ago I wrote that I expected for Surly or Salsa to come up with something new before paying their premium price. 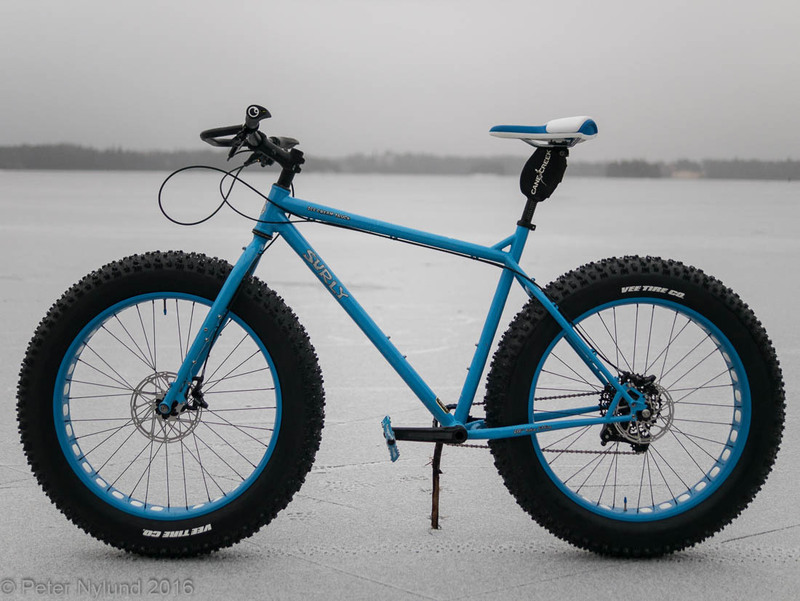 Neither of them did that, and yet here I am with a freshly built Surly Ice Cream Truck fatbike. How did this happen? I actually have two reasons, one of which is totally subjective. 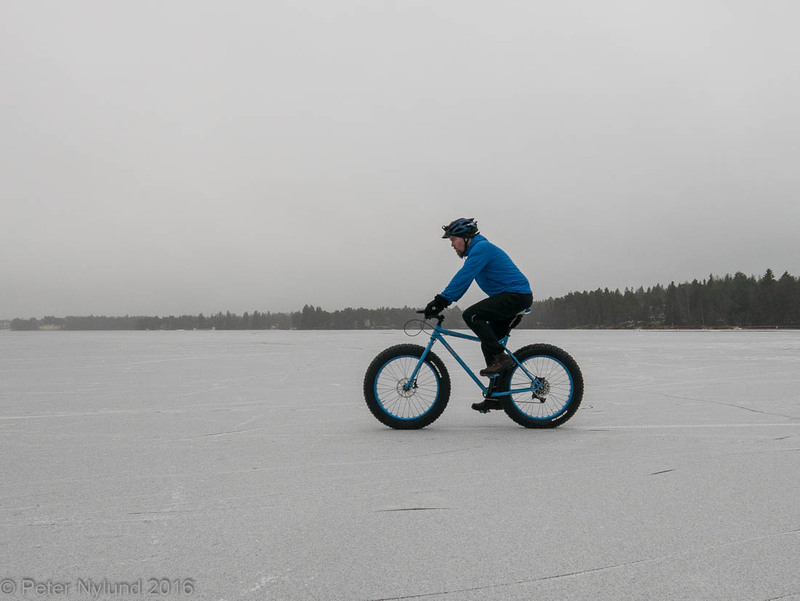 After having spent the last two years mainly on developing my sea kayaking skills, and achieving some sort of goal there, I now look forward to doing more bike riding, including some more demanding bike packing outings. The White 3Fat Pro isn't really enough for that. The second reason is that I've followed the discussions about fatter tires a little closer now. A year ago, it still looked like something was happening, though it in reality only was Espen Wethe of Nakamura Norway who tried to push the envelope. 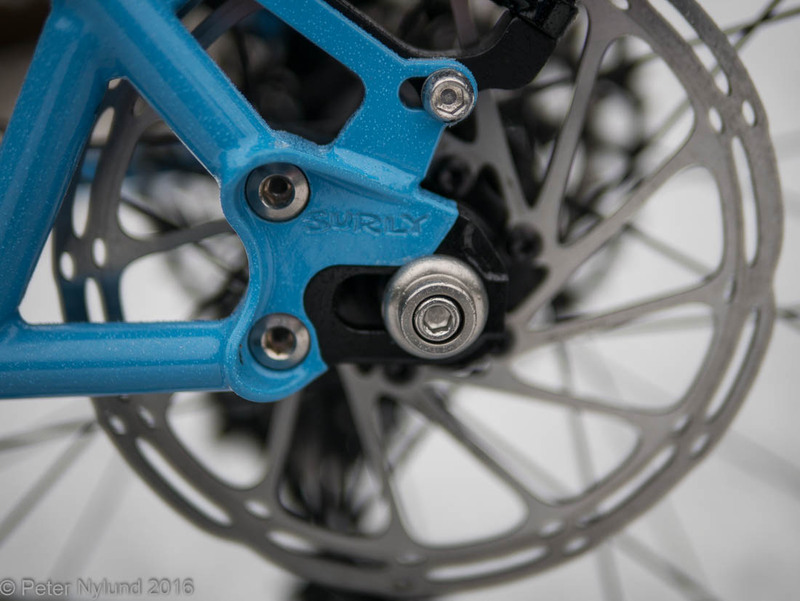 Since then, the only thing that has happened is that Surly came up with the Big Fat Dummy cargo bike, which has clearance for 5.25" tires. A sign of what is under development? There are some challenges with going fatter. The Q-factor of the crank arms are probably quite maxed out now for most people, which might mean that an IGH is needed instead of ordinary gears. Also fatter tires affect the BB height quite a bit, meaning that a bike optimized for 5.5" tires might not work well with 4.5" tires during the summer. There might be technical solutions to this as well, e.g. 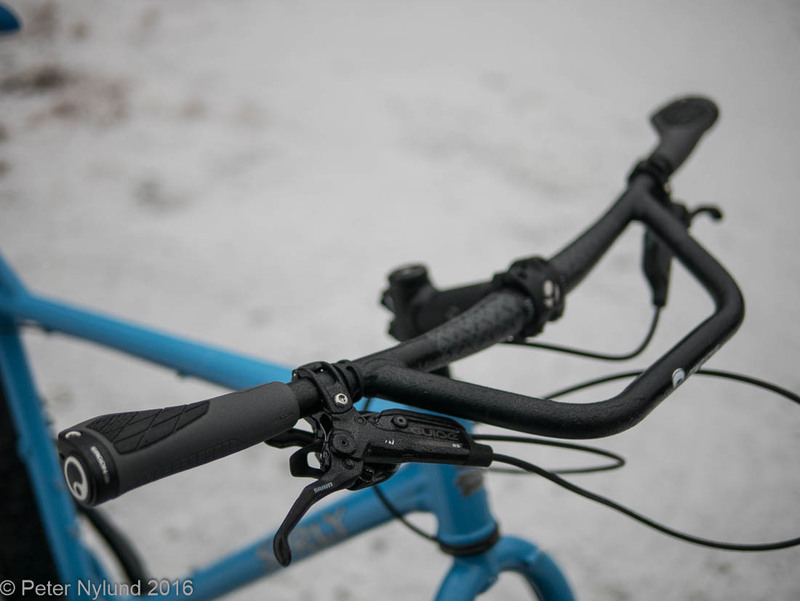 vertically adjustable dropouts or an excentric BB, but it might very well be that a bike made for really fat tires is mainly a winter bike. So, there I was again, considering the Salsa Blackborow or Surly Ice Cream Truck. 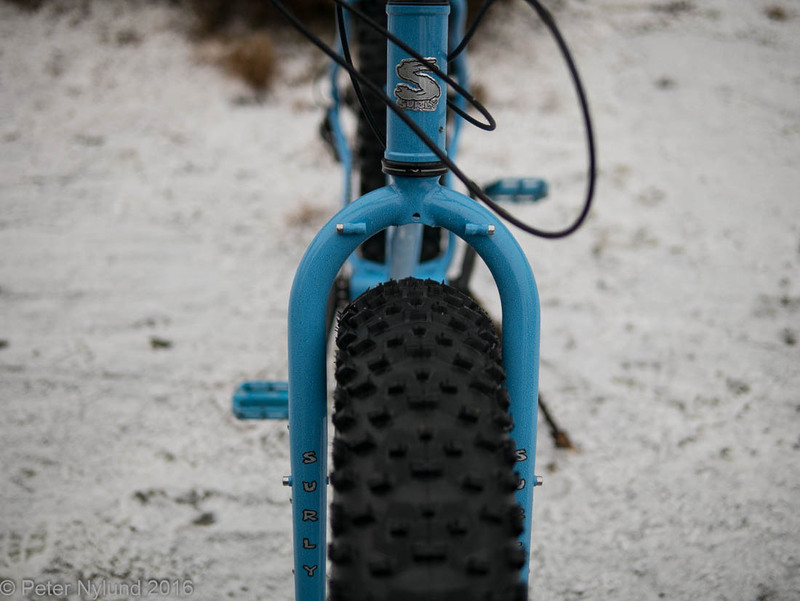 Very few other bikes can fit the currently widest fat tire in production, the 5.05" Vee Snowshoe 2XL. A Finnish alternative actually came up as well, the Pole Taiga, which I found quite intriguing. The Pole philosophy is having very long bikes with a slack head tube angle. I do believe in the concept, but came to the conclusion that the largest Pole Taiga frame size L was not enough for me. I'm not fond of having a lot of seat tube and I also want a good sized main triangle in the frame, to fit a big frame bag. 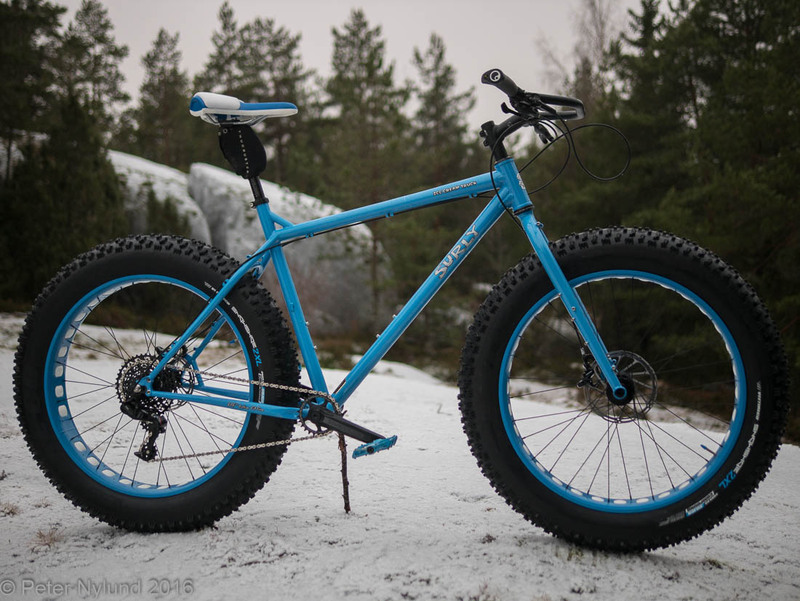 Salsa has given up having the largest tires to fit, and phased out the Blackborow in favour of a new wider Mukluk, which is supposed to fit 4.8" tires on 100 mm rims, but not anything bigger, according to information on the MTBR fatbike forum. 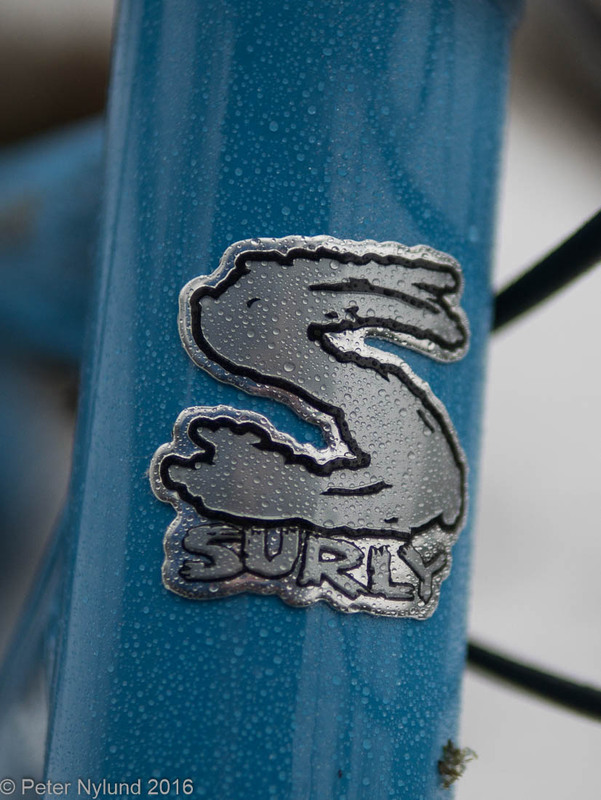 Good old Surly continues with the Ice Cream Truck, which can take the 2XL tires. During some initial discussions in August with Foxcomp, I was advised to wait for something new. Patience, however, is not my strong side and I returned to the subject in November. After again getting good advice against sizing down to an L sized frame, an order for a blue Ice Cream Truck frame in size XL was made. It arrived three weeks later and I got it built in a few days. Some small adjustments still remain, and I'll have to get the rear brake hose shortened. 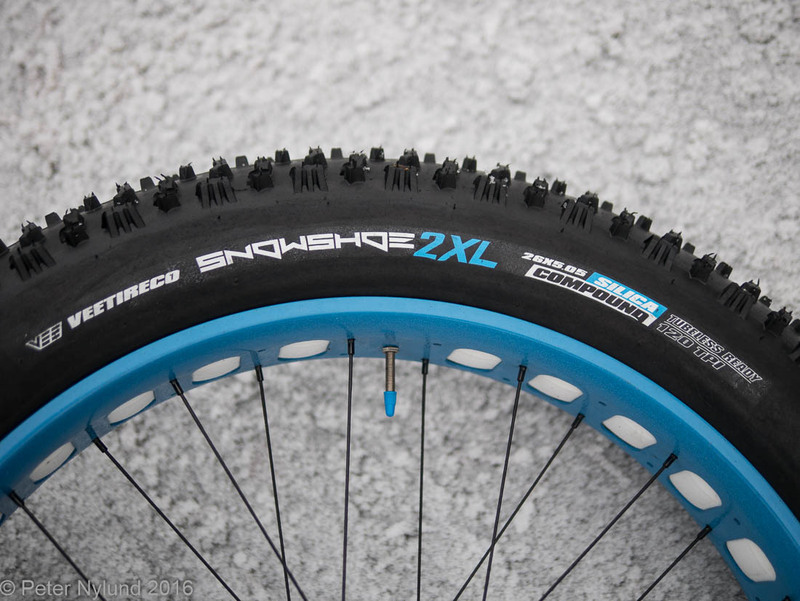 The Vee Showshoe 2XL tires on Clownshoe rims. 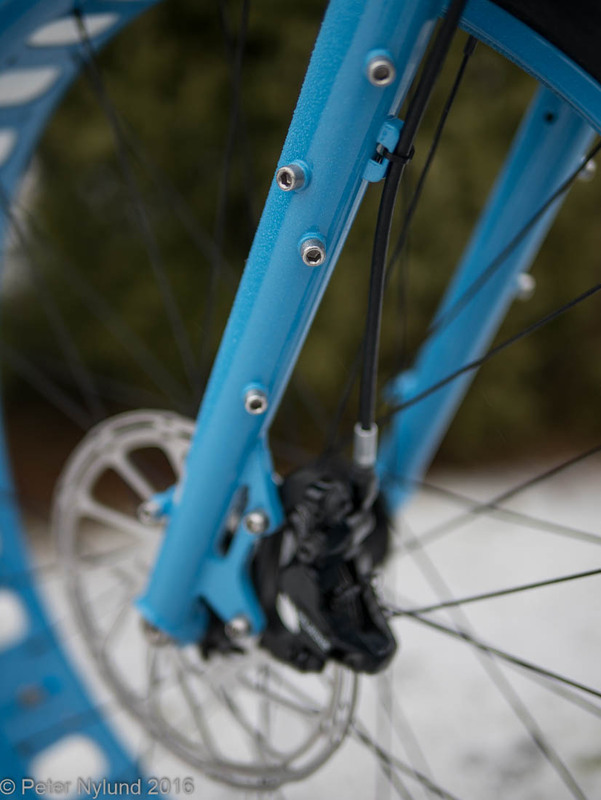 I had the Clownshoe wheelset built by Foxcomp three years ago, but on 135/170 mm hubs for the Salsa Mukluk, after first having the rims powder coated with blue color. The wheelset was rebuilt with Hope 150/190 mm hubs in the beginning of this year. Quite a coincidence that the rim color matches the frame color so well. The 2XL tires really are a lot bigger than the 4.8" Surly Bud tires. On 100 mm rims the width is close to 130 mm and they are quite tall. Steel has soul and Surly only makes steel. Plenty of attachment points on the fork. I will mount the Salsa Anything Cage, though it remains to see which version. 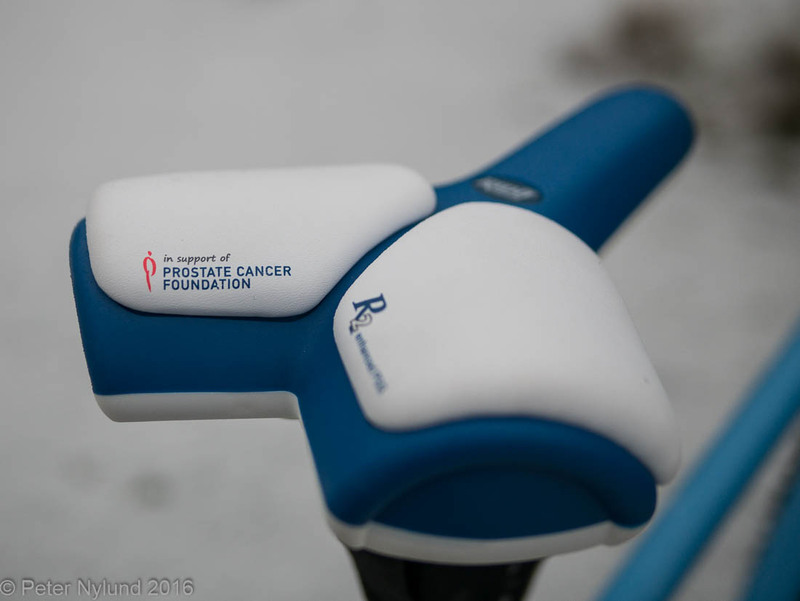 I've used the Rido R2 saddle exclusively since 2010. The comfort for me is superior to anything else. This is a special version, with colors matching the bike and also the Finnish flag. The saddle is mounted to an old Cane Creek Thudbuster LT seat post, which I need to protect my bad back. SRAM Guide RS brakes with 180 mm rotor at front and 160 mm at the rear, my preference for getting the same feeling for both brakes. Also visible is the Surly MDS dropouts for 12 mm through axle. With the axle in the rearmost position there is sufficient room for the 2XL tires. These particular dropouts were hard to get. They have been out of stock everywhere for most of the year and are now to reappear in February or so. I found a pair in a shop in Norway, though they couldn't send anything to Finland. They were ordered to a friendly philosophy professor in Trondheim, who then sent them to me (thanks, Jussi). The clearance is good enough for winter use, about 7 mm to the sides of the chainstays, taking into the account that the tire isn't absolutely true. Since I'm running 1x11 gears, the chain clearance is no problem. The Alpkit Confucius handlebar, sawed down to 740 mm width. I'm hoping that this would provide a nice and stable way to attach a front dry bag. 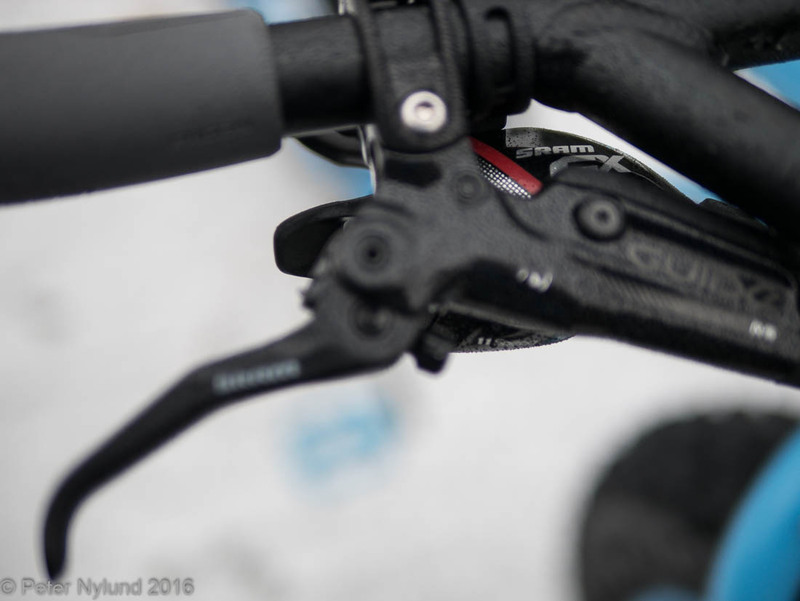 Also shown are the Ergon GS1 grips. I've preferred the Ergon grips since they appeared some seven years ago. 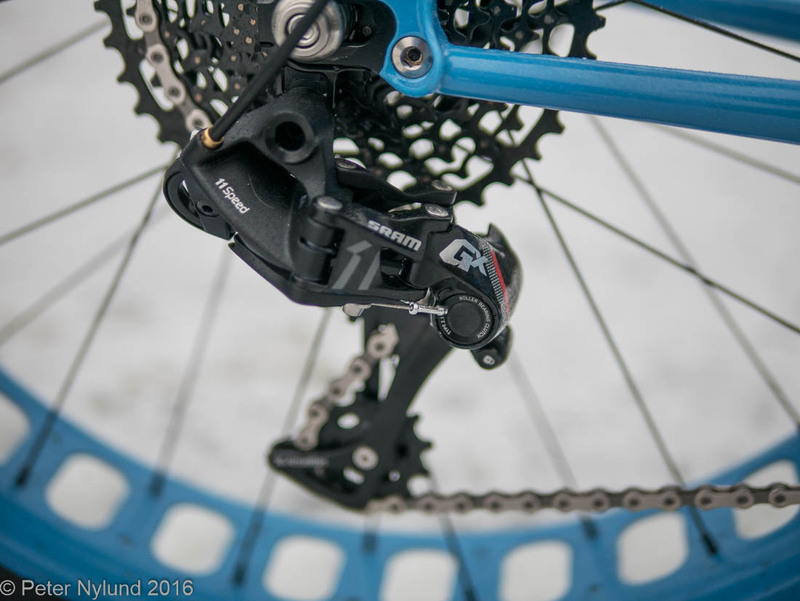 The SRAM GX 11-speed rear derailleur. 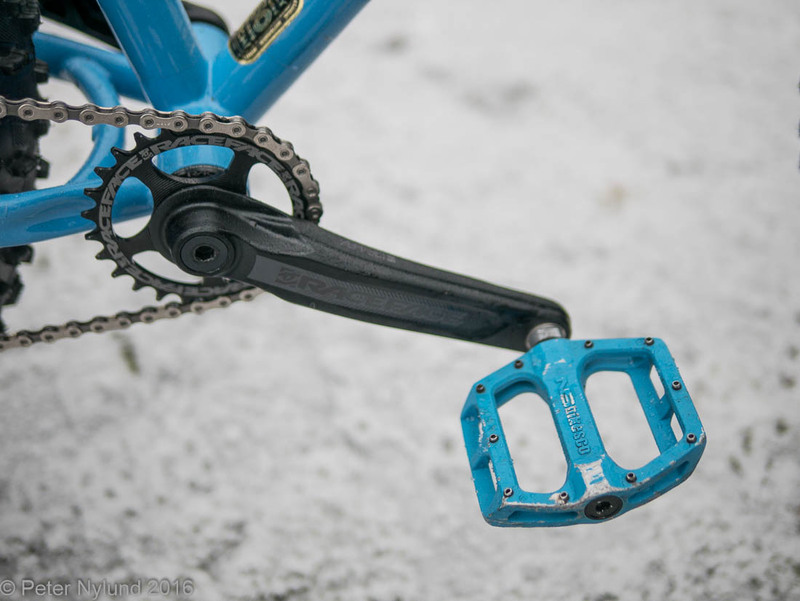 The Race Face Æffect crank set, which is very affordable. 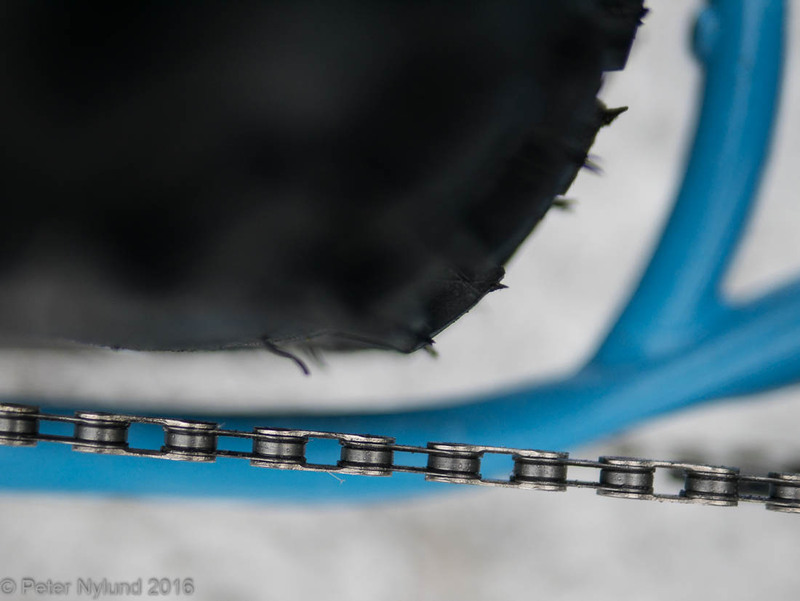 The Cinch system allows smaller chain rings than the traditional 4-bolt 104 BCD system. My intention is to use a 28t or 30t oval chain ring, but nothing was in store yet, so I got a 26t chain ring from Toni, who had one to spare. More that enough clearance at the front. The bike fits me fine, and doesn't actually look so big under me. I do think the bike turned out quite nice. I will get a rear rack for it, probably a Salsa Alternator 190 mm rack. The frame bag from the 29+ Mukluk also fits the ICT. It remains to be seen when the first overnighter trip with it will be. We would need to get some snow first.